A very common question is “How many gallons of water is in my swimming pool?” Well, as there are many variations of pool shapes and sizes there are a few basic formulas that should be used to calculate the size in gallons. Once you know the size of the pool that’s when you’ll now how to treat it with the correct chemical measurements to maintain a good water chemistry. 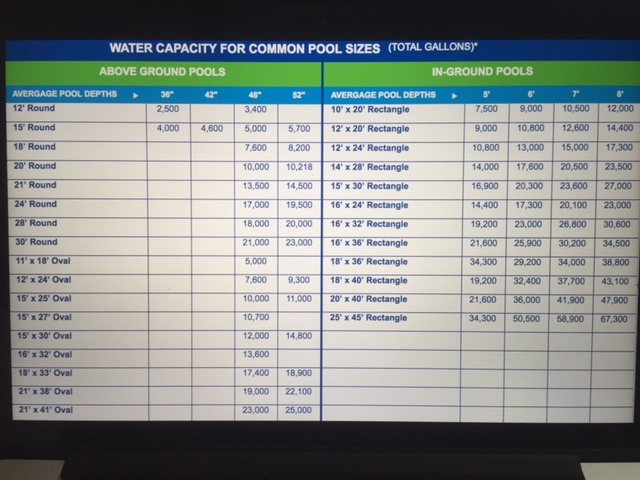 Below is a chart of common pool sizes and the gallons within them. ← How to service a swimming pool.